Austin, Texas – The 2016 Pirelli GT3 Cup Trophy USA launched its 2016 season with a 45-minute thriller that came down to the final laps at the famous Formula-1 grade Circuit of the Americas on Saturday. 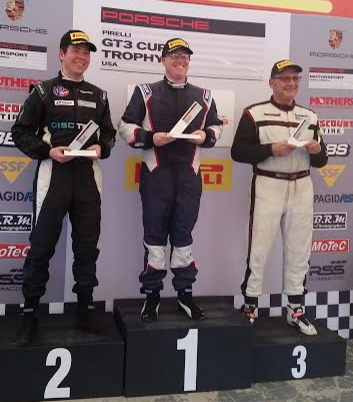 The race featured three classes (Platinum, Diamond, Silver) of competition as series organizers Competent Motorsport opened the 10th Anniversary season for the all-Porsche championship. 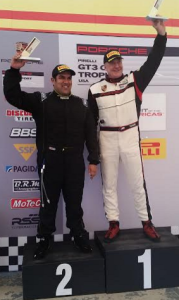 BR Racing’s Robert Todd emerged from a race-long battle with teammate Jesse Menczer to score the first Diamond Class and overall victory of the year, with pole-sitter Allessandro Chiocchetti coming home in third after a race that ran under green flag conditions from start to finish. The 29 car combined-class field got through the trademark elevated Turn 1 nearly unscathed, as a pair of cars were forced off track in the concertina effect at the start. The race continued unabated, with the Diamond class leaders setting the pace. Robert Todd took the lead early on, with teammate Menczer moving to the point on Lap 4 and enjoying a strong run at the front. But managing his time, tires, and traffic, Todd was able to return to the lead on Lap 16 and hold the advantage all the way to the checkered flag for a season-opening victory. The Platinum Class saw Texan John Krieg take what he considered to be his biggest career victory as he came home ahead of Annand Sharma. 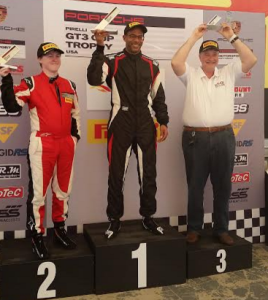 Larry Schnur completed the Platinum class podium and also took top honors in the Masters Platinum Championship. The season-opening Circuit of the Americas race marked the debut of the Silver class, which featured 14 of the highly sought after Porsche Cayman GT4 ClubSport machines. After coping well with relentless pressure for the lead, Kevin Woods delivered an inch-perfect performance in his BR Racing No. 94 Santa Cruz-liveried machine to mark his name as the first-ever winner in the Silver class. Making an audacious start to his racing career, Sean McAllister earned the runner-up position in his first-ever car race for Competition Motorsports. Frank Sellidorf remained among the top-three throughout the entire 18-lap race and took the final place on the Silver class podium with his run to third place. All three classes will be back in action at Circuit of the Americas tomorrow for Race 2 which is set to go green at 2:20 PM Central Time. This entry was posted in News on March 12, 2016 by admin.